Muileann Bheag (pronounced Mullen Vek) is a contemporary Barn conversion renovated and completed in 2017/18 by the current owner to provide an exceptionally spacious, Eco friendly home. The modern interior, while having all the benefits of a highly spec’d new home, does have features throughout the property which reflect the creative gift of the owner, ensuring that it has a warmth and character that is sure to appeal to buyers looking for a quality residence. Throughout the house attention has been focused on keeping the property’s energy use to a minimum. Extensively insulated and using the lowest energy lighting and heating, running costs are remarkably low for a property this size. The property is situated on the periphery of the popular village of Lamlash, just 3 miles from the main ferry port of Brodick. Lamlash is known locally as the commercial hub of Arran, having the council offices, High School and community /leisure centre plus a wide range of popular eating establishments on the door step. It is the most populated villages on the island having approximately 1,000 residents. Muileann Bheag has a private driveway which leads to a parking area in the garden. The property sits centrally in the sizeable plot. The garden is mainly laid to lawn with some beautiful flower beds, established shrubs, apple trees and a raised bed for growing vegetables. A sociable patio area has been created for out door entertaining with views over Benlister Glen. The property is entered from the front elevation into a bright boot room which has underfloor heating and ample space for hanging coats and storing footwear. There is a large cupboard off the boot room which houses the oil fired boiler. Access to the immaculate downstairs shower room is here also. The shower room has a large walk in shower with glazed shower screens, low flush WC and wash hand basin. Tastefully tiled splash back and a heated towel rail. A leaded glazed door takes you from the front lobby into the bright open plan living space. A practical vinyl flooring runs through from the boot and shower room to the kitchen and dining area. The lounge and sun room beyond have solid oak flooring. Recently installed is a beautiful Howden kitchen with wall and base units. Incorporated into the kitchen is an integrated dishwasher, fridge freezer, oven, hob and extractor. Work tops are of solid wood and quality tiles have been used for the splash back. A stainless steel sink with mixer tap over complete this very user friendly kitchen. Window to rear elevation and two front facing windows. A sociable dining area adjacent to the kitchen flows into the lounge area. 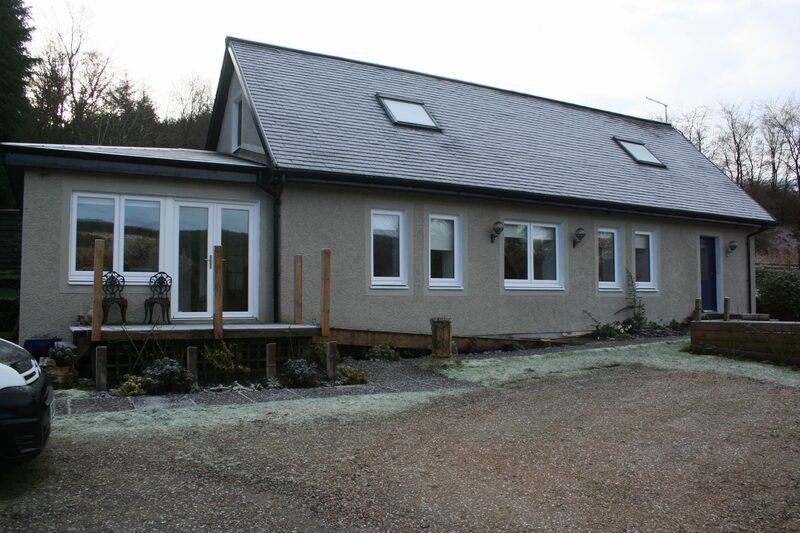 The lounge has three double glazed windows to the front elevation with views over the glen. A beautiful cast iron stove is located in the lounge which will give a secondary heat source and gives the lounge a lovely focal point. From the lounge a glazed timber door opens into the sun room and beyond is a ground floor bedroom. The sun room is a very cosy place to sit and enjoy the views of the garden. Double patio doors open onto a decking area which has a ramp access to the garden. A double bedroom on the lower level is an ideal guest room or subject to requirements would be a useful study. This lovely room has a window overlooking the rear garden. Access to the first floor is via a solid oak staircase from the lounge. The small upper landing leads off to two double bedrooms, the bathroom and a large store cupboard. The spacious upper floor bedrooms are in the eaves of the property and both have characterful sloping ceilings with Velux windows to either side and a window in the gable. Both have built in storage and timber flooring. The bathroom has tiling to the walls and has a vinyl flooring. The suite comprises of a bath with power shower over, low flush WC and wash hand basin. Heated towel rail and ceiling lighting. Velux window to rear elevation. Summary: Heating by Oil Fired Boiler. Mains electricity. Mains water. Drainage - Septic Tank. Directions: From Brodick Terminal, follow the road Clockwise to Lamlash. Continue through the village. As you are leaving the village there is a sign for The Ross Road, stay on the main road and pass this sign, over the bridge and turn immediate right after the bridge. Continue along the track for 200 yards. Muileann Bheag is on the left, along the short driveway.